Cities are increasingly the hubs of economic and social activity. But all too often, growth is accompanied by violence and conflict. The next 50 years will see unprecedented numbers of Africans migrating to urban centres. Most migrants will end up in informal settlements and on the periphery of cities. These urban centres are fragile and beset by high levels of violent crime. Unless solutions are found, the growth and development potential of cities won't be realised. The ISS, in partnership with the World Economic Forum (WEF) Global Agenda Council on Fragility, Violence and Conflict organised a seminar aimed at developing practical policy recommendations on how African governments can strengthen the resilience of their cities. Participants shared the experiences of Johannesburg and Cape Town in designing and implementing multi-partnership strategies to improve community safety. The lessons of the city of Medellin in Colombia were also considered as an important comparison from the global South. Gareth Newham, Head, Governance, Crime and Justice Division, ISS Pretoria, chaired the seminar. Discussions highlighted that city safety strategies tailored to meet the specific local conditions and contexts are integral to building resilience to urban violence. These strategies must be part of process that engages specific local communities who are invested in successfully putting them into practice. There is no one-size-fits-all approach. Although crucial for success, multi-agency and multi-disciplinary strategies driven by local government and key public and private sector stakeholders are very difficult to sustain. The more focused and clear the objectives, (e.g. removing illegal firearms), the more likely success can be measured. The emphasis here is more on creating a safe environment as a precursor to security. Improving city safety has to be seen beyond the narrow policing point of view. To achieve this, non-traditional actors must be brought on board. These include people involved in victim support, schools, healthcare providers and agencies that can better assist in understanding and responding to drivers of crime. Preventing crime requires addressing the conditions and risk factors that encourage criminal activity. The City of Johannesburg developed, and continues to implement, a comprehensive safety strategy that contributes to the Joburg 2030 Economic Development Strategy. Cape Town has experienced notable success with their Central City Improvement Districts private-public partnerships. In Medellin, Colombia, multi-stakeholder initiatives contributed to 80% reduction in murder in the city since the early 1990s. 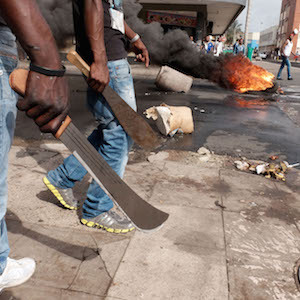 The ICRC has developed a project for urban violence that can be replicated in various cities. Given that Africa will see greater levels of urbanisation – by 2050 over 60% of its population will be living in cities – it is necessary to focus on understanding what is required to develop and implement suitable strategies that will promote safety and city resilience. This is a fundamental part of ensuring that cities become vehicles for inclusive economic growth and improvements in human security and development.